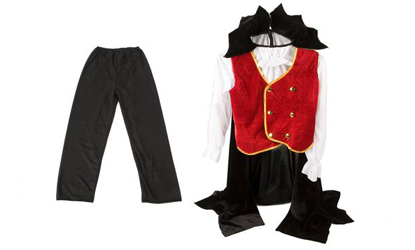 "Halloween" is just around the corner and these Dracula fancy dress costumes are the perfect choice for girls and boys to dress up and do some trick or treat in! Sink your teeth into these bargain outfits now and the kids will be over the moon come Halloween! Black trousers are elasticated, top is all one piece with a black velcro tie up. Trick or Treat? This is a treat they will love! Large age 10-12 approximate length 35"
Please see our other listings for different sizes.